Moscow, March 16, Interfax - It took firefighters almost three hours to extinguish the fire in the Moscow Novodevichy Convent bell tower. The fire, which affected an area of 300 square meters, did not do any damage to the historical building. “The internal premises were not damaged by the fire and external facing plaster fell off in the places affected by the most by the fire,” Alexander Gavrilov, deputy head of the Russian Emergency Situations Ministry’s Main Department for Moscow, told reporters. The fire began at an altitude of 35 meters, he said. The speculated cause of the fire is a short circuit caused by heat guns used for drying the facade during restoration work, a source in the law enforcement agencies told Interfax. In the meantime, the press service for the Moscow Cultural Heritage Department has blamed the fire on the firm doing the restoration work. “The work was done with violations of the established regulations. We believe these violations caused the fire,” the press service said. Russian Deputy Culture Minister Grigory Pirumov, for his part, said that heat guns were not in use on the territory of the convent and the bell tower had been disconnected from the mains power supply. “No work has been done since 11:00 a.m. on March 15. Before that time, the work was done without using flammable materials and there were no workers in the tower. The heat guns had been switched off a week ago and the tower was without power,” the Culture Ministry press service quoted Pirumov as saying. The press service said all restoration work is subject to a guarantee and therefore rebuilding work will be done within the shortest time possible. 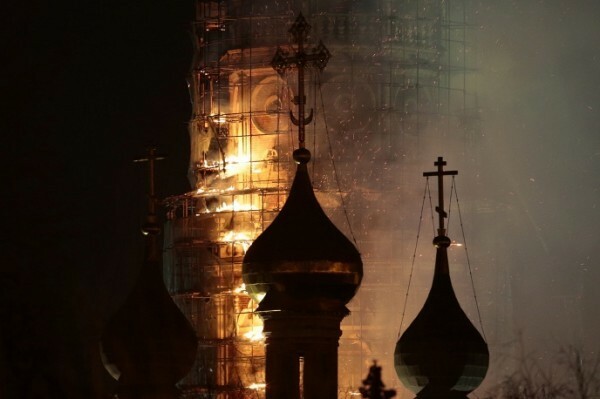 A report saying the wooden scaffolding on the territory of the convent were ablaze was received by the firefighting service at 10:41 p.m. Moscow time. The first firefighters arrived at the scene at 10:45 p.m. The fire was fully extinguished at 1:23 a.m. on Monday, the Russian Emergency Situations Ministry’s Main Department for Moscow told Interfax. The fire affected an area of 300 sq. meters. According to the Russian Emergency Situations Ministry’s Main Department for Moscow, 113 firefighters and 29 units of equipment were used in the operation to extinguish the fire. The Novodevichy Convent was founded by Great Prince Vasily III in honor of the Smolensk icon of Our Lady Odigitria. The convent is protected by UNESCO and hold World Heritage title.